School in the Summer?? What?? Why should I do school in the summer? Take bigger breaks through the year! Many homeschooling families have found that they enjoy a more relaxed year-round schedule rather than following the typical school calendar. I have always done some school through the summer. During the regular school year we took much longer breaks than normal and then we made up for it by continuing some school through the hot summer months. Stay out of the heat! I don’t know where you live, but here in Georgia, the last thing I want to do is be outside in the middle of July! HOT and HUMID! So, instead of braving the heat, we use the hottest times of the day to stay inside and get some school done. It’s a great way to keep your cool! Don’t forget! Another benefit to summer schooling is knowledge retention. We all know that kids forget what they learned after a long break. Most of the first few months of a typical school year are spend reviewing the last few months of the previous year! Stick to the basics. If you’re using the summer months to keep on track in the core subjects, then just stick to basics. Spend time doing math, spelling, reading… the 3 R’s… Reading, Writing, and ‘Rithmatic! Keep it simple and short. It is summer after all! Enjoy your time outside, in the pool, on vacation, etc. but then also spend a little time each day or week doing the basics to keep you sharp! You can choose to do a little each day or maybe just on certain days. Make it work with your schedule. Plan in the fun! Don’t get too caught up in continuing your schooling that you miss out on all the fun of the summer. Plan in advance for some great activities, field trips, fun play-dates (even the teenagers! ), and family fun. Sit down and decide how many fun outings you want to do each month and write them down! Focus on the focus. This means you should decide on what your focus (or concern) areas are and just concentrate on those areas. If spelling is a weak area, then spend your summer working on spelling in a fun way. When you take out the other subjects and just focus on the needs, you have time to make your lessons engaging and fun! Have a plan. The last thing you want to do all summer is struggle with a plan. Take some time and map our your whole summer. It takes less time than you think. Look over each month and write down all your planned events, birthdays, holidays, fun outings, and more. Then write down your school goals for each month. Want to finish a novel each month? Write it down and pick out some books. Need to get to the end of your textbook? Figure out how many chapters you need to finish each month and plan it out. You DON’T have to have detailed plans, just a map. 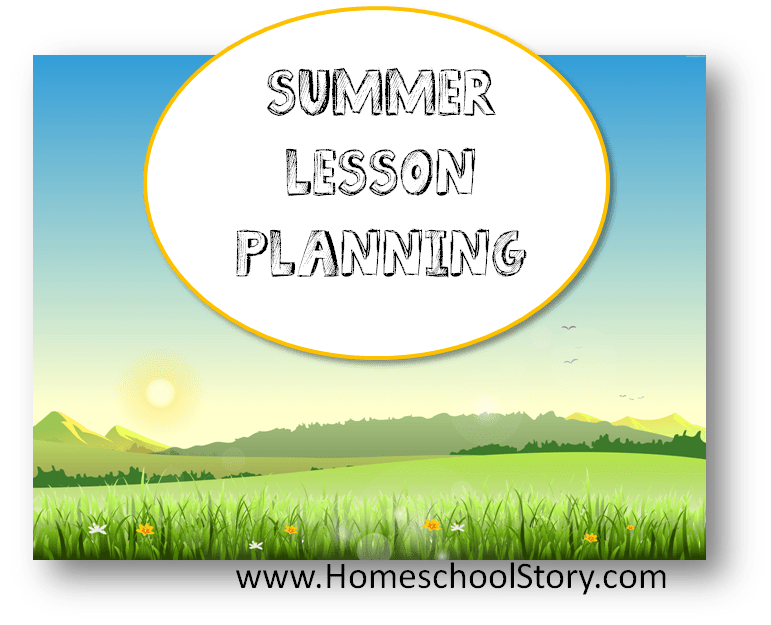 Summer Lesson Planner – This planner is JUST for the summer months of May – August. This is a simple, concise, easy-to-use, and cheap to print planner that will help you keep track of your busy summer schedule! Full color cover with black/white pages inside make this simple to print at home or cheap to print at the office store. Daily and Weekly Schedule planners for up to 6 children, Weekly 2-page layout with Chore chart for up to 6 children, monthly planning sheets, reading goals and tracker sheet, and more! Listen, you are the most important part of your school. As mom/principal/teacher/coach/janitor/etc…your job is hard and usually not very rewarding at times (at least in the short-run). Just because there are benefits to summer schooling doesn’t mean everyone HAS to do it! Remember you must do what’s right for your family and your time….and your sanity! If mom needs a break, then TAKE A BREAK. Take the whole summer off and relax. You will NOT ruin your children or lower their IQ scores just because you need to put the books away. Matter of fact, the kids might enjoy seeing a relaxed mom for a few months! Year round or tradition school year – it’s your choice and their is never one way that works for everyone or every year. Last year, for the FIRST TIME, I completely took off for the summer. I didn’t regret it or second guess myself. I knew that for us, there was no way I was going to manage doing any school. We stopped, packed up the books, and enjoyed our summer. This year, we are doing some math, reading, and spelling on a very relaxed schedule because that’s what works for us this year. I hope you have an AMAZING summer with your family! How will you spend it?